Karnataka HRMS Login at hrms.karnataka.gov.in and Generate Karnataka Employee Salary Bills Services, Transfer, Pay Roll, Suspension, Promotion details online…. Http://hrms.karnataka.gov.in/ is the Karnataka HRMS Main web portal. This web portal was mainly developed as a Human Resource Management System (HRMS) that is used to capture all service particulars of a given employee from the time they start offering their service to when they finish the service. Depending on the instructions provided, one can be able to generate the monthly salary bill of all employees by using the Karnataka website. The government of Karnataka started using the HRMS system on March 2015 thanks to the support offered by the World Bank. At first, the project was only available to a few districts of Karnataka before covering all the other districts. This website is useful in coming up with an accurate and exhaustive database of all employees working with the Karnataka government. Through this method, the government has been able to effectively carry out the administration process that leads to an improvement in productivity and efficiency levels. For the purpose of generating salary bills, the government of Karnataka has close to 21000 Drawing and Disbursing Officers. These DDOs are tasked with the responsibility of generating all the salary bills and finally giving them to the treasury at the end of every month. Initially, this was done manually until the introduction of Karnataka website which made it easier to do things. Available in Karnataka website is a list of all employees that get an annual increment, number of employees that are going to retire in a given month, budget of Karnataka state and important reports that are essential when it comes to decision making. Saving of time used in getting the information of any given government employee. Makes it easy for the government to settle all pensions since one can generate pension papers on the site. The website is transparent meaning all actions carried out can be easily accounted for. Through the website, Karnataka state is able to implement all service rules across every district. On your browser, type in http://hrms.karnataka.gov.in/ as the official link of Karnataka HRMS website. You will automatically be redirected to the homepage of Karnataka HRMSwebsite once you have pressed enter. You can decide to change the language to English if you are not conversant with Kannada that is used in this site. Select HRMS-Govt from the three options that are available in the website I.e. HRMS-Govt, HRMS AIDED and HRMS Boards/Universities. Once you have selected the option, enter your user code or Karnataka HRMS Login ID or user ID in the space set aside for these details. Correctly enter your password that was generated when opening your account. Enter the captcha that is displayed on the image given. If there is no captcha, refresh the image by clicking on the button that is next to the space allocated for the captcha. You will then be required to choose the language that you wish to use. 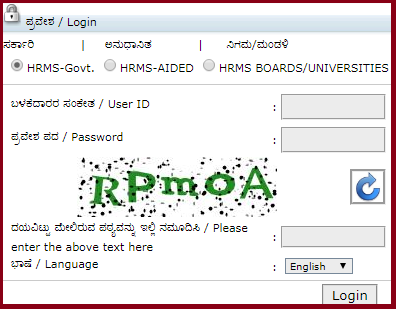 Click on “Login” button to Login Karnataka HRMS website. You will automatically be redirected into the website from where you can carry out anything that you may wish. Once you are done, make sure that you logout of the website to prevent unauthorized access. A person can generate their employee salary slip or report in Karnataka website at any particular time that they term okay since the site operates 24 hours a day. The following steps can be used to generate employee salary slip on Karnataka website. You will automatically be redirected into the Karnataka website page from where you are to login. Select the HRMS-govt that is set aside for government list. Enter the username and password that you registered with followed by the captcha that is displayed. Click on “login” button. Once you have logged into the website, a personal information page will be displayed. On the top right corner of this page, click on ‘Home’ to access the official homepage of the Karnataka website. You will automatically be redirected to the homepage from where you will place your mouse cursor on “payroll” option. In the options that appear click on “Regenerate Draft Pay bill”- This action will direct you to a different page on the site. Correctly fill in the details required like the month that you wish to generate the pay slip. Once all the details have been entered, click on “Check payroll request status”. A status bar will appear showing all the details that were filled in before. Click on the “Home” button and place the cursor on “Payroll” option. Click on “View draft bill” and fill in the details such as pay bill number and head of account. Click on “View report” button once you are done. A new page will pop up displaying the draft pay bill. After viewing the draft pay bill, go back to the homepage and select “payroll” once again. Click on “Approve draft pay bill” from the options that are provided. In the new page, select “Approve” and fill in the establishment number, token number and then click on the “Home” button. You will then have generated the Employee Salary slip. You can then decide to download the report into your computer or print it for future use. How can we solve the problem .when a kgid already existed in another ddo.its for new employees.please guide me. my department about 10 months. I’m not getting even one month payment. My KGID also existed another ddo. Please guide me. Please let me know “How to get the user id and password for this web page to login”.